If you’re any good at jar guessing games, then this is the perfect opportunity for you. No, we’re not asking you to count jelly beans this time… we’re trying to keep sugar far away from our office! But we have put a fun twist on the jelly bean jar classic… and decided to stuff our jar with foam impression trays instead. Different, huh? 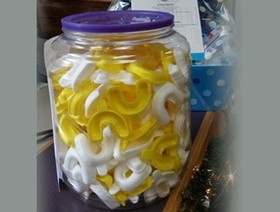 To participate, all you need to do is visit our clinic during the month of December and take a guess about how many foam impression trays are in the jar, and write your guess down on our ballot paper. And if you’re wondering… yes, these are the trays we use to apply fluoride treatments! More info on our Facebook page.